The Husky 1/4 inch NPT Tank Drain Valve is designed to drain moisture that accumulates at the bottom of air compressors during use. Designed to fit most air compressors, the drain valve features a knurled grip for control and easy 1-hand turning. It is crafted with brass to help ensure strength. Easily operated and installed. The Husky DP 18-Gauge 1-1/4 Inch Narrow Crown Stapler is a professional quality, innovated home improvement tool This crown stapler has a lightweight aluminum design and a tool-free adjustable exhaust that conveniently directs exhaust from your face, quick-release nose for easy jam clearing and tool-free depth adjust. The reversible belt hook keeps the tool close by, but not in the way. The anodized aluminum cylinder provides a more durable surface when the piston is firing and retracting during use. This tool also comes equipped with Teflon O-rings which provide less wear and tear on cylinders and pistons ensuring longer life on internal wearable parts, one piece drive blade which reduces the risk of an internal failure and dual spring magazine. Great for use with decorative trim, cabinetry, cabinet backing, crafts and hobbies. The Husky 3/8 inch Standard Poly Bowl Filter is designed to keep air lines maintained. It works to remove dirt and debris larger than 5 microns and helps catch condensed water to improve tool life. The filter features a metal bowl guard that protects against impacts and has a quick-release bowl and quarter-turn drain for ease of use. Ratcheting regulator helps ensure consistent tool performance. Superior air delivery allows operation of more tools simultaneously and maximum tool performance. Patented 1/2 In. Impact Wrench produces 20% more working torque (275 Ft.-lbs) for fast removal of nuts and bolts. Removes most lug nuts and bolts for overall automotive service, body shop, farm, and light truck work. 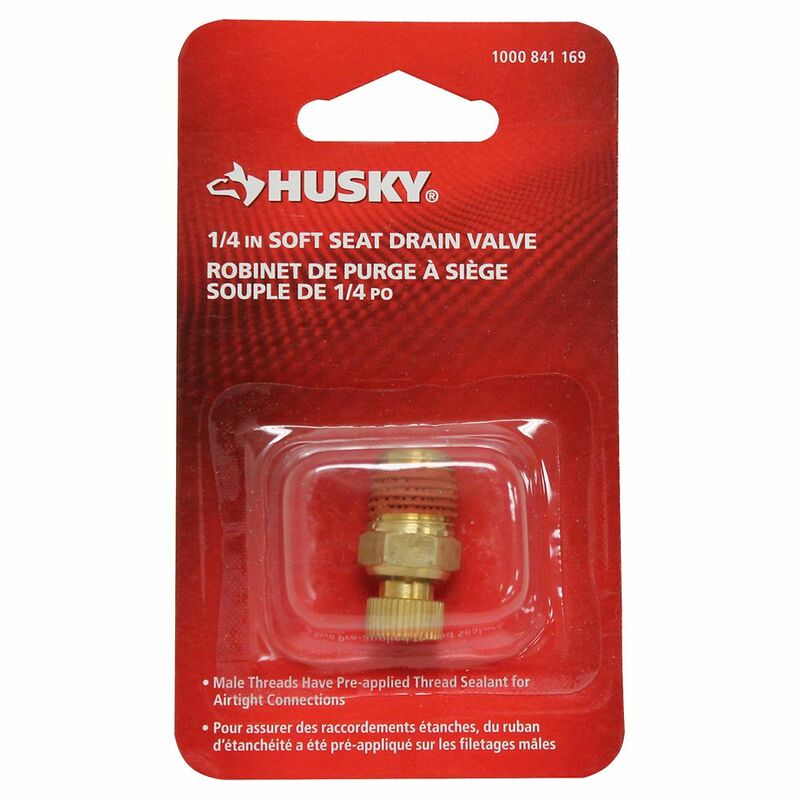 1/4 Inch Drain The Husky 1/4 inch NPT Tank Drain Valve is designed to drain moisture that accumulates at the bottom of air compressors during use. Designed to fit most air compressors, the drain valve features a knurled grip for control and easy 1-hand turning. It is crafted with brass to help ensure strength. Easily operated and installed.